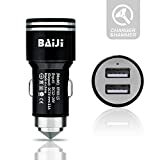 • The BAIJI Car Charger with dual USB ports is specially made of stainless steel material which is strongly durable and a space saver instead of multiple sized car adapters. It enables to charge your power-hungry devices for simultaneous, fastest charging at driving time. No more worries happened about running out of battery of your devices on the road, increasing the assurance of your power capacity. • One great unique function is that this charger can be used as a Life Hammer with the heavy duty design. When you are stuck in the car, the stainless steel end point can help you smash a car window to escape in the event of emergency. With the top advanced technology available, it is able to charge 2 devices at once in 2 USB ports at full speed up to 2.1A or 1.0A per port. A Soft Internal LED indicator to confirm the connection status and will not distract you while driving. Intelligent circuit design to protect devices charging from overheated and over-currents, over charging and short circuit. • Use your original cable or a third-party certified one. • A thin plastic film is stuck on the surface where the USB ports are that you may tear it off if you like.